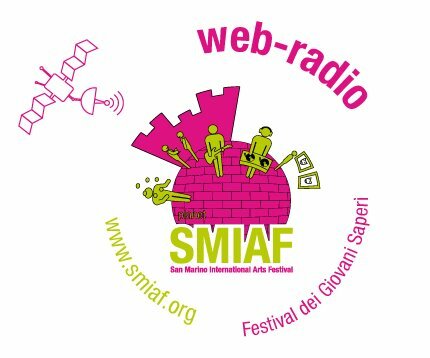 I promised you the details of our LIVE internet radio programmes being broadcast in English and Italian next weekend from SMIAF, the San Marino Festival of Music and Arts. 17.00 hours: talk on “A Digital Agenda for San Marino”, with Steven Muccioli, Graham Attwell, Dirk Stieglitz, Anthony Camilleri & Annalisa Schembri from Malta, Meri Of Nubila, Michele Ghiotti. 21.00 hours: Interview IROL more live concert. Its quite a schedule! And if last year was anything to go on, don’t miss the bands. This year we are providing an internet stream in a number of different format, to suit almost any internet enabled device. And later this week we will be setting up dedicated pages on the Pontydysgu site and the SIAF web site just for this event. Put it in your diary now. This is a Bing generated translation from an entry on the SMIAF festival page on Facebook by Lorenzo Bugli. “WEB RADIO: SMIAF presentation during the days of the festival (3-4-5 August), Graham Attwell (Wales) and Dirk Stieglitz (Germany), employees of the University of Bremen, will take care of the post-broadcasting, at European level, of the bands and groups of the Festival through 2012 SMIAF web radio: an attempt of digitalize San Marino and its services. From Friday, August 19, 3 hours by visiting www.smiaf.org, you can watch live concerts of the evening, then continue during Saturday 4 and Sunday 5 (from 17 onwards) with a respectable schedule: interviews with the artists, staff and visitors of the 5th Edition, chats, posts of guests and participants in workshops, the whole interspersed by good music programme directly from the Workstation 6 (Bruno Reffi). I bought an iPad at the start of this year, out of curiosity and thinking it was time to see what they could do. I was less than convinced I needed one, having already got a MacBook and a kindle, as well as a Samsung S!! phone running on Gingerbread. My first impressions were mixed. Whilst very easy to use, and with many great looking apps, what was I supposed to do with it? It quickly became my internet radio player of choice, I added a lot of music and even started watching a little television, which I haven’t done for a long time. I also downloaded a few games, but quickly got bored with those and irritated with the in-game purchasing adverts from so-called free games. The one productivity app I got to like was Keynote, as i allowed me just in time preparation of slides on air flights. I also liked the ability to quickly find web sites and documents in informal meetings (especially in my local pub)! But that was just about as far as it went, although once or twice I ventured out on trips without my kindle, driven mainly by airline weight restrictions forcing me to cut the number of devices I carry. And so I arrive in Portugal for the PLE 2012 conference with the usual stack of equipment (Portugal being warm, I could carry more gear and still keep under !0 Kilos luggage). MacBook, iPad, Kindle, Phone, Zoom recorder, spare batteries, connectors, cables etc. But, however careful I am something always gets left behind. This time it was the power lead for my MacBook. I guess I could have borrowed a lead. But, given all my files are in Dropbox, I though I would give the iPad a go. And on the whole I liked it. It feels very different, not having a laptop computer. Almost as if something is missing. But their were three things I really liked. One was just the weight factor. I like whenever possible to walk to conference venues and to try to see a little of the city I am in. the iPad is light enough you do not really notice you are carrying it. The second was the battery life. No more arriving at a venue and searching around for power leads before everyone else gets them. the third was a session I chaired. There were three speakers. Following a short introduction from each, posing a series of issues arising from their papers, participants were supposed to have short in depth round table discussions to look at those issues. One of the speakers, Arunangsu Chatterjee, had, at the last moment, been unable to travel to Portugal, but had offered to participate remotely. We were able to connect the iPad to a projector to allow him to introduce this paper. And then when we spit into round table groups, we simply used the iPad for him to take part through skype. And strangely it worked. Of course we could have done that with a computer. But somehow he seemed to have more presence on the tablet and when people moved around we simply ‘took him with us’ on the iPad. I can see tablet computers opening up many possibilities sin terms of mobile communications. And yes, the next time I go to a conference I might even leave the laptop behind! Taccle was one of our most successful projects. The original handbook on technology for learning went out in some 7000 hard copies in six languages, with a number of further languages being added by volunteer translators and regular reprints in different countries. This is not counting the thousand of downloads. 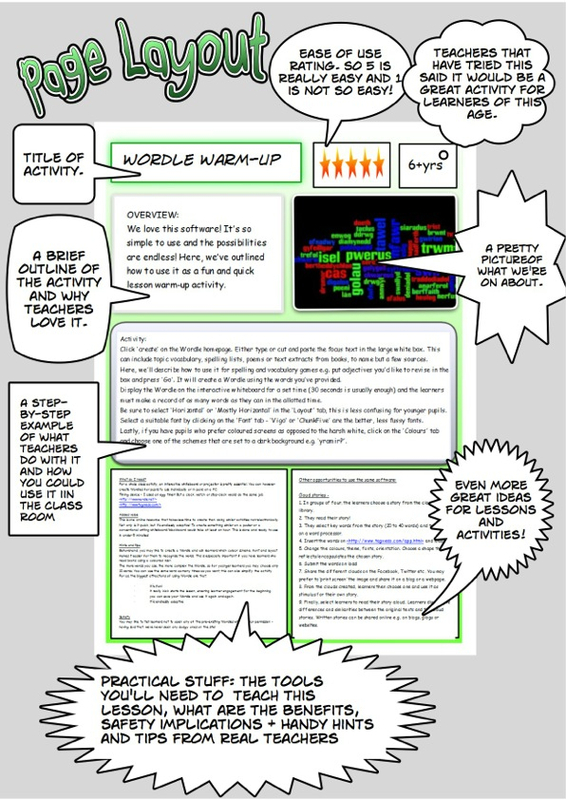 The handbook was designed for teachers wanting to introduce e-learning into their practice. There was also a series of training events for teachers based on the handbook. Both the handbook and the courses were rated highly by teachers but feedback from readers and from course participants was that there were still ‘gaps’ that needed to be filled. Firstly, although teachers across the subject range said they found the both the courses and the handbook useful for developing generic technical skills there were many who still found difficulty in translating that into specific learning activities within their subject area or sector. Secondly, although many teachers, as a result of reading the handbook or attending the courses, now feel confident about designing learning objects or using web 2.0 applications, they are less confident about engaging pupils in producing and publishing their own. The TACCLE 2 project addresses these issues by providing a series of 5 supplementary handbooks (in Dutch, English, German, Italian, Spanish, Portuguese and Romanian) written in the same style as the original, around specific subjects – primary education, maths, science and technology, key competences, arts and culture and humanities. Nic Daniels and Jenny Hughes are editing the first handbook on primary education now and we hope to publish it in October (we will put out an order form in next couple of weeks). Nic has been working on the design of the handbook. And I loved this mock up template he has circulated to project partners. It gives an idea of what you can expect from the project. You can keep up to date with development on the project web site. Everyday I get invitations to conferences. Most can only be called academic spam. You know the ones. Conferences you are not remotely interested in. Conferences with about 30 or 40 strands spanning the knowledge of the world. Conferences with a so called academic committee with around 50 members. Indeed I have even ended up on one or tow of those without my knowledge! And then just occasionally I get something which leaps out at me. So it was when I received an email from John Traxler entitled “Call for Proposals: TEL, the Crisis and the Response. the workshop is being held at the Alpine Rendez-Vous (ARV) is ‘an established atypical scientific event’ focused on Technology Enhanced Learning (TEL). The ARV series of events are promoted by TELEARC and EATEL associations. The call for proposals is as follows. The TEL research community has undoubtedly been successful over the last fifteen or twenty years in extending, enriching and even challenging the practices and theories of education within its professions and within its institutions, and through them has engaged in turn with the institutions and professions of industry and government. These have however been largely inward-looking discourses best suited perhaps to a world characterised by stability, progress and growth. These are all now problematic and uncertain, and call for new discourses within the TEL research community and across its borders. The world is now increasingly characterised by challenges, disturbances and discontinuities that threaten these dominant notions of stability, progress and growth. These represent the grand challenges to the TEL research community, challenges to the community to stay relevant, responsive, rigorous and useful. economic and resource crises, including long-term radical increases in economic inequality within nations; youth unemployment across Europe, the polarisation of employment and the decline in growth; sovereign debt defaults and banking failures; mineral and energy constraints;. TEL and the industrialisation of education; marginal communities and the globalization and corporatisation of learning; futures thinking as a way to explore TEL in relation to resilience; the political economy of technology in higher education and technological responses to the crisis of capitalism; the role of openness as a driver for innovation, equity and access; digital literacies and their capacity to shift TEL beyond skills and employability in an increasingly turbulent future; connectedness and mobility as seemingly the defining characteristics of our societies; the role and responsibility of research and of higher education as these crises unfold, the complicity or ambiguity of TEL in their development; is the current TEL ecosystem and environment sustainable, is it sufficiently responsive and resilient, how extent does TEL research question, support, stimulate, challenge and provoke its host higher education sector? TEL is at the intersection of technology and learning and encapsulates many of the ideals, problems and potential of both. Education and technology permeate all of the perspectives outlined above, some more than others. It is possible however that they could ameliorate some of their consequences or amplify and exaggerate others. TEL has been a project and a community nurtured within the institutions and organisations of formal education in the recent decades of relative stability and prosperity in the developed nations of Asia-Pacific, North America and Western Europe. Some of the critical challenges directly relate to the perceived missions of the TEL project and its community. Contemporary formal education in schools, colleges and universities is increasingly reliant on TEL. The TEL community is however currently poorly equipped either to resist the progress of these crises today or to enable individuals and communities to flourish despite their consequences tomorrow. The transition movement, the open movement and the occupy movement are all parts of wider responses to differing perceptions and perspectives of the underlying malaise. The proposed workshop will enrich conversations by bringing in new perspectives and will explore how the different communities can learn from each other, perhaps bringing about more open, participative and fluid models of education. It brings together researchers seeking to articulate these concerns and responses, and develop a shared understanding that will engage and inform the TEL community. It is timely, necessary and unique, and will contribute to a clearer and more worthwhile formulation of the Grand Challenges for TEL in the coming years. One of the outputs of the workshop will be a special edition of a peer-reviewed journal; other options, such as an open access journal, a book or a website, are possible if there is a consensus. Please submit an individual or collective two-page position paper, or propose a structured discussion or debate on the role and place of TEL in the light of our analysis. Contributions will be selected by the organisers on the basis of individual quality of the papers and the overall balance and coherence of the programme. Proposals should be sent to John Traxler by 17 August. Personal Learning Environments: Context is King! The last few weeks have been hectic with travel, conferences, bids and more. In the next few days ~I will try to update on some of this but first, before I forget, some quick thoughts on the Personal Learning Environments 2012 conference in Aveiro. First on the form of the conference. PLE is what is now becoming known as a flipped conference. Rather than formal paper presentations, chairs of sessions work together with presenters to find more participative forms of delivery involving interaction with participants. The aim is not just to present research findings and ideas, but to discuss and build on that work and develop new knowledge. This was the third PLE conference and with a sufficient number of participants having been at previous conferences and enthusiastic about the format, the sessions were even better than before. This year we were better at recording outcomes and many of the sessions have been well documented on the project web site. The physical space is central to this type of event and in that respect Aveiro was perfect with flexible spaces and good connectivity. As in previous years we continued our practice of organising two unkeynote presentations, each with two people. Antonio Dias de Figueiredo and Frances Bell involved the participants in discussing a number of key issues, crowd sourced previous to the conference (see report on Frances’s blog). On the second day Ricardo Torres and Grainne Conole presented a series of video clips reflecting on the VLE versus PLE debate. And whilst I think that the issue is somewhat out of date, it sparked a big and ongoing response on twitter and on the Cloudworks site. Each year we try to introduce new ideas. This year we piloted the idea of ‘One Conference – Two venues’ with face to face meet ups taking place (more or less) simultaneously in Aveiro and Melbourne. The time differences prohibited any real time link ups. But with both venues using the same #PLEConf hash tag, there was an almost seamless 24 hour flow of tweets around PLEs. Interestingly it was hard at times to work out which of the venues the tweet had been sent from. Anotehr innovation this year was experimenting with the use of Mozilla Badges. 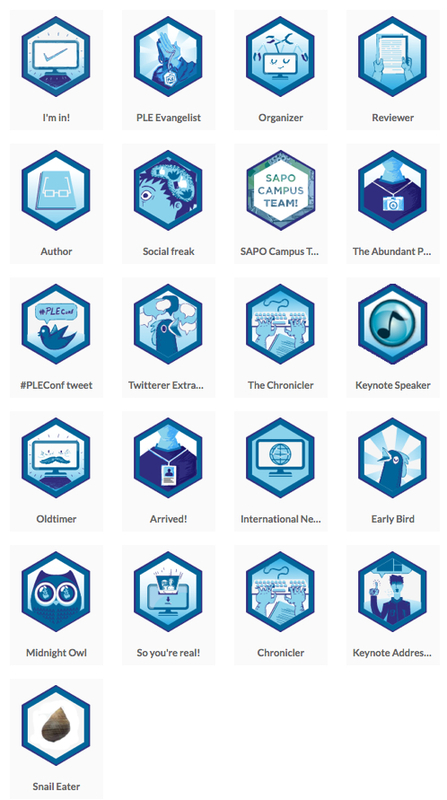 Whilst the badge titles seemed to multiply alarmingly in the run up to the conference, it provided us with a very good insight into both technical and pedagogical issues involved with badges. I think overall the verdict was positive but their are still questions to answer. 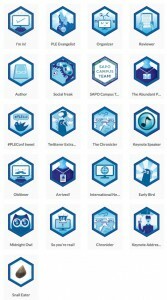 You can see a full collection of the badges here. This year the organising committee instigated a two stage review for contributions – reviewing firstly abstracts and then secondly full papers. I was personally opposed to this fearing that such a ‘heavier’ review process would discourage participants. I think I was wrong. It might be due to other factors, but the quality of the contributions this year – at least those that I have read – seemed much higher than in previous years. And, if done well, such a review can support people in developing their ideas. Overall though, I remain unconvinced about review procedures and wonder if we could try some other forms of supporting contributors in developing their ideas (open review processes or on-line review workshops? ). There was also a noticeable change in terms of the focus on many contributions. At the first conference, in Barcelona in 2010, PLEs were a largely new and unexplored concept. Much effort and discussion was expended in trying to arrive at a common definition of a PLE, in debating the dichotomy between technological and pedagogy approaches and constructs to developing Personal Learning Environments, and the role of PLEs in institutional strategies. Further discussions focused on the impact and affordance of Web 2.0 and social software on developing PLEs. The following year at the Southampton PLE conference concerns – for instance over a tension between pedagogic and technical developments – appeared less irreconcilable with the majority of participants agreeing that a PLE can be seen as a pedagogical approach with many implications for the learning processes, underpinned by a ‘hard’ technological base. Participants also agreed on the need to continue thinking around practices for enriching the learning process through formal and non formal learning and begun to explore the different contexts in which PLEs might be used. In this process, attempts to invent new acronyms to differentiate contexts (of PLE components, or tools), often at only a theoretical level, addded little extra-value to the previous analysis. Aveiro had a different focus. Many of these previous debates seemed slightly irrelevant. PLEs were no longer a construct but a reality 0- in part I guess due to the increasing use of social media for learning but also with the main streaming of Massive Open On-line Courses and the increasing attention being paid to extra institutional learning. Where as before we had many discussions about what a PLE might look like, there were now many examples of applications supporting PLEs, ranging from mash ups to Cloud services to institutional provision. Thus the focus shifted to the different contexts in which learning takes place and to pedagogic processed, in particular how to support learners in developing their learning through a PLE. And with an increased focus on context, research had broadened. Instead of being confined within the education domain, we are seeing the emergence of interdisciplinary research – for instance bringing together work science and innovation research to understand how PLEs might be of use for learning at the workplace. The latter subject is of particular interest to me and a group of us agreed we would set up a wiki to continue working on this. Of course commitments made in the hothouse of an intensive conference are not always fulfilled but I hope we manage to do this. And if anyone else is interested please get in touch. Finally, despite the best intentions of all of us to support the conference organisers, inevitably much of the work falls on the shoulder of the local team. Many thanks to Carlos Santos and to Luis Pedro and all the other colleagues from Aveiro who made the conference such a success. You can read the full, nicely formatted, pretty pictured, report here, and make comments on any of the topics on the accompanying blog. The Personal Learning Envrinments conference is a flipped conference. Traditional paper sessions are frowned on and presenters are invited to put forward their idea of how to engage participants in teh different sessions. Sessionc hairs are asked to negotiate with presenters. Thus it was that this afternoon I received an email from Linda Castenda who is chairing the session with my paper about Developing work Based Personal Learning Environments. We will be together in the A3 session, on the Thursday 11th at 011 O’clock in the room Number 2. I’m really happy of sharing with you this moment and I hope to have the possibility of trying a different kind of session that help us to find new ways for enriching or work and for find new ways of collaborating together. 11:10 to 11:15 Presentation and explanation of the session dynamic (me). For it I would love to have a picture of you for including on the presentation. Each paper will be localized in three different “spaces” in the same classroom. The audience will be divided into three groups that will be passing by each paper and each one of you will have to explain your work in 9 minutes to three different groups of people. After 9 minutes I’ll ring an alarm to change the group. I know you have to repeat the explanation 3 times, but It would help them to be more close to you and to be more “active” during the explanations. You could use for your presentation a slideshow (in your computer or tablet, a pamphlet, a paper, a trip tic, or whatever you want… BUT taking into account that you are presenting for few people only. Attendees will have some papers to include questions and comments of the presentations that we will recover after the round of presenting. If you don’t mind (if you do, please, let it me know) I will love to record each presentation in video for uploading to the web after the session. After the questions I will ask you for doing a deliverable by paper WITH the attendees… maybe you can think in something to do around your paper (questions, short activity, or whatever) , or maybe we can do something generic… what about a kind of map of relationships between the research presented by you and the attendees research area (including contact details)? I am very happy with the idea. But then the problem – I had brought no slides for this session. So in record time I have hacked together a quick presentation and thanks to the speed of teh network here in Aveiro, have got it up on slideshare already. I am off to Porto tomorrow and then on to Aveiro for the Personal Learning Environment Conference 2012. Ironically I was reading an article a couple of days ago saying “It’s time to create the Conference 2.0 by flipping the current setup of major education conferences”. I don’t know if the PLE conference can be called ‘major’. I think one of the ideas of the Conference 2.0 is to get away form the idea of a major conference filled with endless tracks covering everything under the sun and mainly attracting delegate through educational tourism offers. I prefer smaller, more intimate and more connected events. PLE is a flipped conference. I am not going to claim it is the first, but in all three of the conferences we have organised we have placed a stress on interaction and knowledge sharing. We have fought against traditional paper presentations, instead arguing that the papers can be read on line and what we want of in depth discussion and consideration of the ideas behind the papers. To that end we have invited chair people and participants to come up with their own ideas on how this can be facilitated. We have introduced unconferencing slots – including the ‘speakers corner’ – this year on the beach! and pecha keucha. We introduced unkeynotes – with speakers working in pairs to develop presentations that involved participants – both face to face and on-line (see crowdsourcing for one of this years unkeynotes by Ricardo Torres and Grainne Conole). This years innovations include the integration of Mozilla badges into the conference social networking site and the ‘One Conference – Two Venues’ idea – with face to face sessions taking place at the same time (more or less) in Aveiro and Brisbane. Hope to see many of you face to face or on-line later this week. This is a work in progress. It is the first draft of a paper by Ludger Deitmer and myself for the Personal Learning Environments Conference to be held in Aveiro next week. We are looking at how we might develop work based PLEs drawing on the work on the forthcoming Learning Layers project. there is a downloadable version (in word format) at the bottom of the post. Your feedback is very welcome. This paper is based on a literature review and interviews with employers and trainers in the north German building and construction trades. The work was undertaken in preparing a project application, Learning Layers, for the European Research Programme. The paper looks at the development of High Performance Work Systems to support innovation in Small and Medium enterprises. It discusses the potential of Personal Learning environments to support informal and work based learning. The paper goes on to look at the characteristics and organisation of the building and construction industry and at education and training in the sector. It outlines an approach to developing the use of PLEs based on a series of layers to support informal interactions with people across enterprises, supports creation, maturing and interaction with learning materials as boundary objects and a layer that situates and scaffolds learning support into the physical workplace and captures people’s interactions with physical artefacts inviting them to share their experiences. Research and development in Personal Learning Environments has made considerable progress in recent years. Yet although often acknowledging the importance of informal learning, such research continues to be largely focused on formal educational institutions from either higher or vocational training and education. Far less attention has been paid to work based and work integrated learning and still less to the particular context of learning at work in Small and Medium Enterprises (SMEs) (Gustavsen, Nyhan, Ennals, 2007). Yet it could be argued that it is in just these contexts, where work can provide a rich learning environment and where there is growing need for continuing professional development to meet demands from new technology, new materials and changing work processes, that PLEs could have the greatest impact. A work environment in which the workers plan, control and validate their work tasks can both competitive and productive (Asheim 2007). It also requires that workers are able to make incremental and continuous improvements to work processes to develop better products and services. This in turn requires continuous learning. In contrast to predominant forms of continuous training based on activities outside the workplace, and in response to the perceived lack of take up of Technology Enhanced Learning in SMEs, we propose a dual approach, based on informal learning and the development of network and mobile technologies including Personal Learning Environments. This paper will describe an approach being developed for learning in SMEs, specifically in the building and construction industry in north Germany. Our approach is based on the development of high performance work systems in industrial clusters of SMEs. In this context, individual learning leads to incremental innovation within enterprises. Personal Learning environments serve both to support individual learning and organisational learning through a bringing together of learning processes (and technology) and knowledge management within both individual SMEs and dispersed networks of SMEs in industrial clusters. Our approach is also based on linking informal and work based learning and practice and formal training. The paper is based on literature research and on interviews with employers and trainers in the building and construction sector. This work was undertaken in preparation for a project called Learning Layers, to be undertaken through the European Commission Seventh Framework for Research and due to commence in November 2012. In the paper we look at the ideas behind high performance work systems and industrial clusters before examining the nature and context of the building and construction industries and particularly of SMEs within the industrial cluster. We develop a scenario of how PLEs might be used for learning and suggest necessary developments to be undertaken to facilitate the adaptation of such technologies for learning. Many industries are undergoing a period of rapid change with the introduction of new technologies, new production concepts, work processes and materials. This is resulting in new quality requirements for products and processes which lead to an emergence of new skill requirements at all levels of personnel, including management, workers, technicians, apprentices and trainees. These changes can be described as a paradigmatic shift from traditional forms of production towards leaner, agile and flexible production based on high performance work systems (Toner 2011). Leaner business organisations have less hierarchical layers and develop ‘close to production intelligence’ in order to be more flexible to change and to customer demands. The qualifications required of workers within such production or service environment are broader than in traditional workplaces reflecting a shift from functional skills towards multiskilling. Skilled workers require practical and theoretical knowledge in order to act competently in the planning, preparation, production and control of work and to coordinate with other departments in or outside the company. Information and communication technologies – including both technologies for learning and for knowledge management – are required to allow more decentralised control to support just-in-time and flexible production and services. A key to flexibility and high productivity lies in the qualification profiles of the workforce and in the development of worker-oriented production technologies, which allow more flexible control in the production process. The following table illustrates the change in innovation management within such companies and the consequences for the skilling of workers, technicians and the apprentices. This change in production philosophy can be described as a move from a top-down management approach towards a participative management approach (Rauner, Rasmussen & Corbett, 1988; Deitmer & Attwell, 2000) which requires a commitment to innovation at all level of the workforce, not just at the management level. Toner (2011) points out that a ‘learning by doing’ strategy in an innovative work environment can lead to gradual improvement in the efficiency of the production processes and product design and performance (Toner 2011). Such improvements are based on high performance skills by workers. High Performance Work Structures are based on the practical knowledge of the workers underpinned by theoretical knowledge (Nyhan 2002, Rauner). Practical knowledge is generated in the context of application and is shaped by criteria such as practicability, functionality and the failure free use of technologies. Broad Job Classifications which allow functional flexibility by limiting occupational demarcations and requiring workers to be competent across a broader range of tasks than is conventionally expected which in turn requires broad based training. High Performance Work Systems require a commitment to innovation at all levels of the workforce; this process is more inclusive, democratic and incremental rather than elitist, imposed and radical. The empowerment of the work force to make proposals for changes and improvement is key. However the adoption of such practices requires continuous learning linked to knowledge management and systems and technologies to support such processes. Thus the development of work based PLEs could be linked to wider processes of innovation within SMEs. Many SMEs organise themselves in clusters or networks in order to collaborate, to share knowledge and skill, or even to exchange staff. The network dimension is particularly important as regional clusters have been understood as an instrument of scaling learning in heavily SME dependent sectors. This is reflected by large EU projects like European Cluster Excellence Initiative. It is much easier to economically justify the creation of learning materials which can be reused in an entire cluster and hence by many organisations than just for a few individuals. The challenge from a network point of view would be to identify such high potential learning materials and to find ways to distribute them efficiently within the network. The current focus of cluster initiatives is almost exclusively on scaling up formal training by organising training across network members. While a Communities of Practice perspective has been adopted in some cases to address informal learning processes, these are usually not effectively supported through information technologies (Prestkvern & Bardalen 2008). Effects resulting from relationships in networks of small organisations for learning processes have received little attention in Technology Enhanced Learning research to date, despite these networks having been identified as a potential way of fostering favourable learning conditions (Deitmer & Attwell 2000). However, we can build here on work in diverse fields looking into these network effects. Seminal work by Granovetter (1973) has made distinction between strong and weak ties in such networks. Further studies investigated the network effects on experience sharing (Baum, 1998), on social networks (Cross, 2001), of trust on knowledge transfer (Levin, 2004) on communication for innovation (Müller-Prothmann, 2006), on communication with new media (Haythornthwaite, 2002) and more recently on networked learning (Ryberg, 2008). However, the effects on informal learning and on the creation of shared knowledge artefacts are still open issues. The development and implementation of Personal Learning Environments within the context of regional clusters could support this form of networked informal learning. However there remain barriers. Research suggests (Perifanou, forthcoming) that SMEs may still be concerned about a perceived loss of competitiveness through openness in collaborative learning contexts. Similarly some SMEs regard learning materials, especially those generated within their organisation, as a potential source of future revenue. Research suggests that in SMEs much learning takes place in the workplace and through work processes, is multi episodic, is often informal, is problem based and takes place on a just in time basis (Hart, 2011). Rather than a reliance on formal or designated trainers, much training and learning involves the passing on of skills and knowledge from skilled workers (Attwell and Baumgartl, 2009). Dehnbostel (2009) says that learning in the workplace is the oldest and most common method of vocational qualification, developing experience, motivation and social relations. Learning at work is self-directed, process-oriented form of lifelong learning that essentially contributes to personality development and professionalism, and promotes innovation and employability (Streumer, 2001; Dehnbostel, 2009; Fischer, Boreham and Nyhan, 2004). A survey undertaken in Germany found work based learning comprised of 43% of training and learning undertaken by enterprises (Büchter et al., 2000). Thus work based learning is seen as a potential approach to developing continuing learning for the broader competences and work process knowledge required for high performance workplaces. Rather than a reliance on formal or designated trainers, much training and learning involves the passing on of skills and knowledge from skilled workers (Attwell and Baumgartl, 2009). In other words, learning is highly individualized and heavily integrated with contextual work practices. While this form of delivery (learning from individual experience) is highly effective for the individual and has been shown to be intrinsically motivating by both the need to solve problems and by personal interest (Attwell, 2007; Hague & Lohan, 2009), it does not scale well: if individual experiences are not further taken up in systematic organisational learning practices, learning remains costly, fragmented and unsystematic. It has been suggested that Technology Enhanced Learning can overcome this problem of scaling and of systematisation of informal and work based learning. However its potential has not yet been fully realized and especially in many Small and Medium Enterprises (SME), the take-up has not been effective. A critical review of the way information technologies are being used for workplace learning (Kraiger, 2008) concludes that most solutions are targeted towards a learning model based on the idea of formal, direct instruction. TEL initiatives tend to be based upon a traditional business training model with modules, lectures and seminars transferred from face to face interactions to onscreen interactions, retaining the standard tutor/student relationship and the reliance on formal and to some extent standardized course material and curricula. The development of work based Personal Learning Environments have the potential to link informal learning in the workplace to more formal training. Furthermore they could promote the sharing of experience and work practices and promote collaborative learning within networks of SMEs. Research suggests that in SMEs much learning not only takes place in the workplace and through work processes, but is multi episodic, is often informal, is problem based and takes place on a just in time basis (Hart, 2011). Learning in the workplace draws on a multitude of existing ‘resources’ – many of which have not been designed for learning purposes (like colleagues, Internet, Intranet) (Kooken et al. 2007). Research on whether these experiential forms of learning lead to effective learning outcomes are mixed. Purely self-directed learning has been shown to be less effective than most guided learning in many laboratory studies and in educational settings (Mayer, 2004). On the other hand, explorative learning in work settings has often been reported to be beneficial, e.g. for allowing construction of mental models and improving transfer (Keith & Frese, 2005). Some form of guidance may be necessary to direct learners’ attention to relevant materials and support their learning (Bell & Kozlowsky, 2008). This is especially true for learners at initial levels (Lindstaedt et al. 2010). One approach to this issue is to provide scaffolding. The use of scaffolding as a metaphor refers to the provision of temporary support for the completion of a task that a learner might otherwise be unable to achieve. Scaffolding extends the socio-cultural approach of Vygotsky. Vygotsky (1978) suggested that support for learning was provided by a Significantly Knowledgeable Other, who might be a teachers or trainer, but could also be a colleague or peer. Attwell has suggested that such support can be embodied in technology. However, scaffolding knowledge in different domains and in particular in domains that involve a relationship between knowledge and practice requires a closer approach to learning episodes and to the use of physical objects for learning within the workplace. Thus rather than seeing a PLE as a containers or connections- or even as a pedagogical approach – PLEs might be seen instead as a flexible process to scaffold individual and community learning and knowledge development. In the first section of this paper we have looked at the idea of high performance work systems and innovation and knowledge development within industrial clusters. We have suggested that Personal Learning Environments could facilitate and develop these processes through building on informal learning in the workplace. We have recognized the necessity for support for learning through networked scaffolding. In the second section, we will examine in more depth the north German Building and Construction sector, developing a scenario of how PLEs might work in such a context. We will; go on to suggest further research which is needed to refine our idea of how to develop work based PLEs. The building and construction trades are undergoing a period of rapid change with the introduction of green building techniques and materials and new work processes and standards. The EU directive makes near zero energy building mandatory by 2021 (European Parliament 2009). This is resulting in the development of new skill requirements for work on building sites. The sector is characterized by a small number of large companies and a large number of SMEs in both general building and construction and in specialized craft trades. Building and construction projects require more interactive collaboration within as well as between different craft trade companies within the cluster. Training for skilled workers has traditionally been provided through apprenticeships in most countries. Continuing training is becoming increasingly important for dealing with technological change. However further training programmes are often conducted outside the workplace with limited connection to real work projects and processes and there is often little transfer of learning. Costs are a constraint for building enterprises, especially SMEs, in providing off the job courses (Schulte and Spöttl, 2009). Although In Germany, as in some other European countries, there is a training levy for sharing training costs between enterprises, there remains a wider issues of how to share knowledge both within enterprises and between workers in different workplaces. Other issues include how to provide just in time training to meet new needs and how to link formal training with informal learning and work based practice in the different craft trades. The developments of new processes and materials provide substantial challenges for the construction industry. Traditional educational and training methods are proving to be insufficient to meet the challenge of the rapid emergence of new skill and quality requirements (for example those related to green building techniques or building materials). This requires much faster involvement and action at three levels – individual, organisational and cluster. The increased rate of technical change introduces greater uncertainty for firms, which, in turn, demands an increased capacity for problem solving skills (Toner 2011). Despite the recession there is a shortage of skilled craftspeople in some European regions and a problem in recruiting young people for apprenticeships in higher skilled craft work in the building and construction industry. In the present period of economic uncertainty, it is worth noting that the total turnover of the construction industry in 2010 (EU27) was 1186 billion Euros forming 9,7% of the GDP in 2010 (EU27). The construction industry is the biggest industrial employer in Europe with 13,9 million operatives making up 6,6% of the total employment in EU27 and if programmes were to be launched to stimulate economies, construction has a high multiplier effect. Although the European Commission has pointed to the lack of take up of e-Learning in various sectors, this is probably too simplistic an analysis. It may be more that in all sectors, e-learning has been used to a greater or lesser extent for learning in particular occupations and for particular tasks. For example e-Learning is used for those professions which most use computers e.g. in the building and construction industries, by architects and engineers. Equally e-learning is used for generic competences such as learning foreign languages or accounting. In the past few years, emerging technologies (such as mobile devices or social networks) have rapidly spread into all areas of our life. However, while employees in SMEs increasingly use these technologies for private purposes as well as for informal learning, enterprises have not in general recognized the personal use of technologies as effectively supporting informal learning. As a consequence, the use of these emerging technologies has not been systematically taken up as a sustainable learning strategy that is integrated with other forms of learning at the workplace. Ensure that peer production is unlocked: Barriers to participation need to be lowered, the massive reuse of existing materials has to be realized, and experiences people make in physical contexts needs to be included. Ensure individuals receive scaffolds to deal with the growing abundance: We need to research concepts of networked scaffolding and research the effectiveness of scaffolds across different contexts. Ensure shared meaning of work practices at individual, organisational and inter-organisational levels emerges from these interactions: We need to lower barriers for participation, allow emergence as a social negotiation process and knowledge maturing across institutional boundaries, and research the role of physical artefacts and context in this process. Work based Personal Learning Environments will be based on a series of Learning Layers. In building heavily on existing research on situated and contextualised learning, Learning Layers provide a meaningful learning context when people interact with people, digital and physical artefacts for their informal learning. Learning Layers provide a shared conceptual foundation independent of the personal tools people use for learning. Learning Layers can flexibly be switched on and off, to allow modular and flexible views of the abundance of existing resources in learning interactions. These views both restrict the perspective of the abundant opportunities and augment the learning experience through scaffolds for meaningful learning both in and across digital and physical interaction. At the same time, Learning Layers invite processes of social contribution for peer production through providing views of existing digital resources and making it easy to capture and share physical interactions. Peer production then becomes a way to establish new and complementary views of existing materials and interactions. a layer that situates and scaffolds learning support into the physical workplace and captures people’s interactions with physical artefacts inviting them to share their experiences with them. All three interaction layers draw on a common Social Semantic Layer that ensures learning is embedded in a meaningful context. This layer captures and emerges the shared understanding in the community of learners by supporting the negotiation of meaning. To achieve this, the social semantic layer captures a number of models and lets the community evolve these models through PLEs in a social negotiation process. The following scenario within the building and construction industry illustrate how these technologies will be operational in the regional North West German building and construction cluster. A regional training provider for the building industry offers courses on how to install PLC (programmable logic control) based lighting systems, a new technology designed for more efficient energy consumption. Veronika, a vocational trainer at a regional branch, designs a course on PLC based systems where she provides electronic materials. In the course, she distributes QR tags which participants can stick on devices in order to receive information on demand. She also integrates work-based exercises in her teaching where users tag PLC systems with QR tags, take pictures or create short videos, and add their personal experiences with these systems that they make available for other people as learning experiences [Artefact Interaction Layer]. Paul is a skilled electrician working in craft trade electrician service company who has not used PLC technology before. The PLC installation instructions are difficult to understand for him because he lacks experience with such installations. He scans the QR tag attached to the PLC with his tablet PC. The system suggests course materials from Veronika’s course, relevant standards for the installation from a technical publisher, as well as a short video documenting the installation steps recorded by a colleague [Artefact Interaction Layer]. Moreover, Paul receives the information that two people have experience with this particular PLC [Social Semantic Layer]. Paul calls one of them over Skype and checks that his plan and understanding of the installation is sound and then proceeds with the installation with the help of the video. As several further questions remain, Paul posts them using voice recording and photo to a Q&A tool [People Interaction Layer]. Paul’s question is forwarded to Dieter, an Electrical “Meister” in another SME using similar devices, based on his user profile indicating that he has experience with PLC, and because he has indicated his willingness to help. Dieter briefly answers Paul’s question, including links to materials (Pictures, …) available in the learning layers repository. Dieter is a well-known “problem solver” in his SME network. By support of the Learning Layers technology he has created a training business in which he gives technical advice service and trainings to other building electrician companies. His comments can be traced by others and recognized as service from the Electrician’s Guild. Veronika, the vocational trainer, is notified by the system that there are currently many new activities around PLC programming and views the concrete questions that occurred [Social Semantic Layer]. With the notification, she also gets recommendations for the most active and helpful discussions and for most suitable and high quality materials people have suggested [Learning Materials Interaction Layer]. She decides to include these in her course to illustrate solutions to potential problems. The four layers described in the previous section provide the core of the conceptual and technological approach for the development of the PLEs. There are two further critical elements that will be crucial for reaching our vision. These elements are needed for effectively integrating the different layers. We need further investigation into the relationship of informal learning and workplace practices on the individual, organisational and on the network level. In extending previous work, we will especially focus on physical workplaces and the opportunities and constraints that come with supporting learning. Secondly, we require a further focus on existing barriers and opportunities for scaling peer production and learning in cooperative-competitive SME networks. This work will create a model for scaling informal learning in a networked SME context and ensure that the use of tools is integrated through practice as suggested for example by Wenger, et al. (2009). But we generally acknowledge that a key factor for enterprises to staying agile and adaptive is to have a highly skilled workforce. With the rapid development of new technologies, staying up-to-date with know-how and skills increasingly becomes a challenge in many sectors. Our idea is to base PLes on mobile devices, either the users’ personal devices or devices provided by the enterprises. However, the Learning Layers concept is based on fast and flexible deployment in a networked SME setting with heterogeneous infrastructural requirements and conditions. Current learning architectures are typically deployed as monolithic in-house installations that lack flexibility for inter-SME networking in response to fast-changing environments. On the other hand, externally hosted solutions are too restricted to features, devices and environments supported by the provider, again impeding flexibility and fast development cycles. Thus, the challenge of both fast and flexible development and deployment of learning solutions is currently not optimally catered for. This issue requires further research and development. This paper presents the early stages of research and development towards producing a system to support Personal Learning Environments in the workplace. There remains much work to do in realising our vision. We are attempting both to theoretically bring together approaches to innovation and knowledge management with learning and at the same time to develop pedagogical approaches to scaffolding learning in the workplace and develop technologies which can support the use of PLEs in networked organisational settings. Our ambition is not merely to produce a proof of concept but to roll out a scalable system which can support learning in large scale networks of SMEs. Our approach to developing the use of PLEs is based on a series of layers to support informal interactions with people across enterprises, supports creation, maturing and interaction with learning materials as boundary objects and a layer that situates and scaffolds learning support into the physical workplace and captures people’s interactions with physical artefacts inviting them to share their experiences. The authors wish to acknowledge the contribution of the partners in the Learning Layers project application, on whose work this paper draws heavily. Kozlowski, S. and Bell, B. (2008). “Team learning, development, and adaptation.” Work group learning: Understanding, improving and assessing how groups learn in organizations: 15-44. Braczyk, H.; Cooke, P.; Heidenreich, M.; (eds.) Regional Innovation Systems, London, UCL Press, 1998. Büchter, Karin/Christe, Gerhard (2000), Qualifikationsdefizite in kleinen und mittleren Unternehmen?, in: Hoffmann, Thomas/Kohl, Heribert/Schreurs, Margarete (Hg. ): Weiterbildung als kooperative Gestaltungsaufgabe. Handlungshilfen für Innovation und Beschäftigungsförderung in Unternehmen, Verwaltung und Organisationen. Neuwied, S. 69-80. Camagni, R. (ed.). Innovation Networks: Spatial Perspectives. London, New York: Belhaven, 1991. Cross, R., Parker, A., Prusak, L., & Borgatti, S. P. (2001). Knowing What We Know: Supporting Knowledge Creation and Sharing in Social Networks. Organizational Dynamics, 30(2), 100-120. Deitmer, L & Heinemann, L. (2009), ‘Evaluation approaches for workplace learning partnerships in VET: how to investigate the learning dimension?’, In: Towards integration of work and learning: strategies for connectivity and transformation, eds. Marja-Leena Stenström & Päivi Tynjälä, Springer International, Doordrecht. Deitmer, L., Gerds, P. (2002), Developing a regional dialogue on VET and training, in: Kämaräinen, P., Attwell, G.. and Brown, A. (eds.) Transformation of learning in education and training. Key qualifications revisited. Office for Official Publications of the European Communities, European Centre for the development of Vocational Training, Cedefop. Luxemburg. Deitmer, L.; Attwell, G.(2000): Partnership and Networks: a Dynamic Approach to Learning in Regions. Nyhan, B.; Attwell, G.; Deitmer, L., (eds.) Towards the Learning Region. Education and Regional Innovation in the European Union and the United States, CEDEFOP, Thessaloniki. S. 61-70. European Parliament (2009) Announcement of European Commission on workplace learning. EU Communications 933/3 (cited from UK National Apprenticeship Service, Richard Marsh speach, 02/2012, Apprenticeship Week, London. Floren, H. Hofmaier, B. (2003), Investigating Swedish project networks in the area of workplace development and health promotion by an support and evaluation approach. Halmstad: School of Business and Engineering,. Haythornthwaite, C. (2002). Strong, Weak, and Latent Ties and the Impact of New Media. The Information Society 18(5), 385-401. Mayer, R. E. (2004). Should there be a three-strikes rule against pure discovery learning? The case for guided methods of instruction. American Psychologist, 59, 14-19. Müller-Prothmann, T. (2006). Leveraging Knowledge Communication for Innovation. Framework, Methods and Applications of Social Network Analysis in Research and Development. . Frankfurt Peter Lang. Nyhan, B., (ed.) (2002) Taking steps towards the knowledge economy reflection on the process of knowledge developments, European Centre for the development of Vocational Training, CEDEFOP. Nyhan, B. (2002) Capturing the knowledge embedded in practice through action research In: Barry Nyhan (eds) (2001), 111-129. Ryberg, T., & Larsen, M. C. (2008). Networked identities: understanding relationships between strong and weak ties in networked environments. Journal of Computer Assisted Learning, 24(2), 103-115. Streumer, J. (ed.) (2001). Perspectives on learning at the workplace: Theoretical positions, organisational factors, learning processes and effects. Proceedings Second Conference HRD Research and Practice across Europe, January 26-27, 2001. UFHRD, Euresform, AHRD. Enschede: University of Twente. Vygotsky L.(1978) Mind in society: The development of higher psychological processes. Cambridge, MA, Harvard University Press.